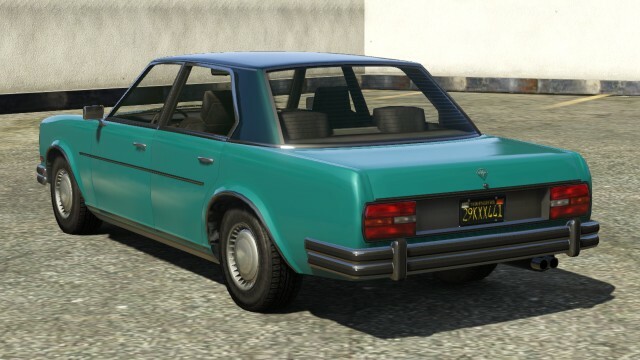 The Benefactor Glendale is a 4-door sedan in several GTA games. In GTA 5, the car was introduced in the I’m Not a Hipster Update. The Benefactor Glendale is based on the Mercedes-Benz W123 (most likely the 280D, as the car has a diesel engine) with front fascia cues from the older W114 and a very similar design of the rear and the taillights like the full-size Mercedes-Benz W108/109. With these design cues, it is probably the bulkier cousin of the GTA III-era’s Admiral, which is based on the smaller Mercedes-Benz 190 series. It also takes design cues, mostly at the rear fascia and taillight cluster, from the BMW E3 3.0Si/Bavaria. The Benefactor Glendale is powered by a high-revving, diesel V6 coupled with a FR layout. The Glendale is a heavy car, The weight plus a soft suspension and the somewhat weak engine means the car understeers through corners despite heavy throttle work, often resulting in spin-outs due to its terrible handling. Poor weight distribution and body roll may result in the vehicle losing control easily, especially at high speeds. The car’s acceleration is above average for the majority of the sedan class, but is still mediocre to other car classes in general. Despite these shortcomings, the Benefactor Glendale has a good top speed which barely touches 200 mph, which is surprising for a vehicle of its age and class. Durability is average for most sedans, as the car can only take a few head-on collisions before its engine fails. The Benefactor Glendale belongs to the Sedans class of vehicles. 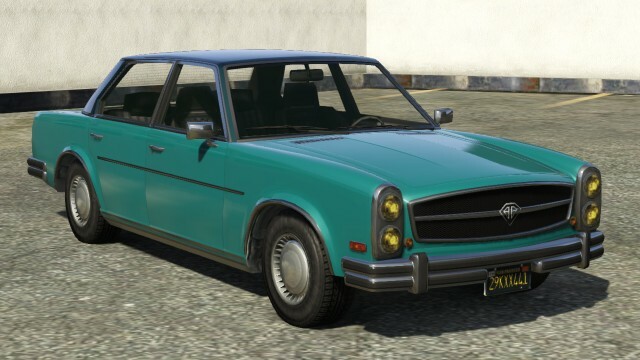 Despite being a sedan, the Benefactor Glendale has the typical engine sound of SUVs and pickup trucks, this is because it has a Diesel engine, despite most SUVs with this engine sound being powered by a gasoline engine, its engine noise is shared with the Dubsta, Granger, Sadler, Bison and the Bodhi. There are 18 mod categories available. Optional hoods and trunks are available in either primary or secondary colour, and feature a narrow pinstripe.